Here is the video clip of my Marshall 1960B with X-pattern speakers combination. under different kind of speakers combination. Vintage 30 speakers connected. You can compare these two classic speakers easily. The sensitivity of Vintage 30 is 100dB, but G12T-75 speaker is 97dB. you can hear the Vintage 30 more than G12T-75. 2) Speakers total pwer handling. 3) Positives and Negatives of the speakers. you can use any kind of different speakers combination. you can also follow the design of Mesa/Boogie Roadking 4x12" cabinet(parallel and vertical combination). the exactly tone of either Bogner or Mesa/Boogie cabinets. Your Marshall 1960B cabinet definitely will NOT become Bogner Uberschall cabinet. structure and material will also affect the tone. This modification brings my Marshall 1960B cabinet to life. 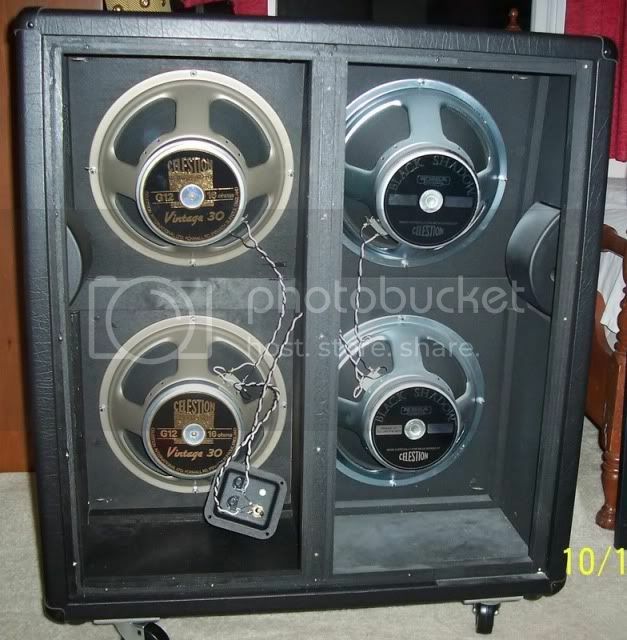 My Marshall 1960B cabinet became much tighter and smoother highs by using Vintage 30 speakers in.